Quick Read: Our future selves are strangers to us. For any brand marketer that wants to drive a habit change among people, this could be a million dollar insight. That’s a common question Tim Ferriss asks his interviewees in The Tim Ferriss Show. The answers are always wise, instructive and helpful. As they ought to be. For the exercise of looking back and reflecting upon one’s journey so far, tends to be a highly visual and (thereby) a pretty straightforward affair in our minds. The idea of looking into a younger version of oneself was also the central theme of a fascinating photography project called Reflections by Tom Hussey. 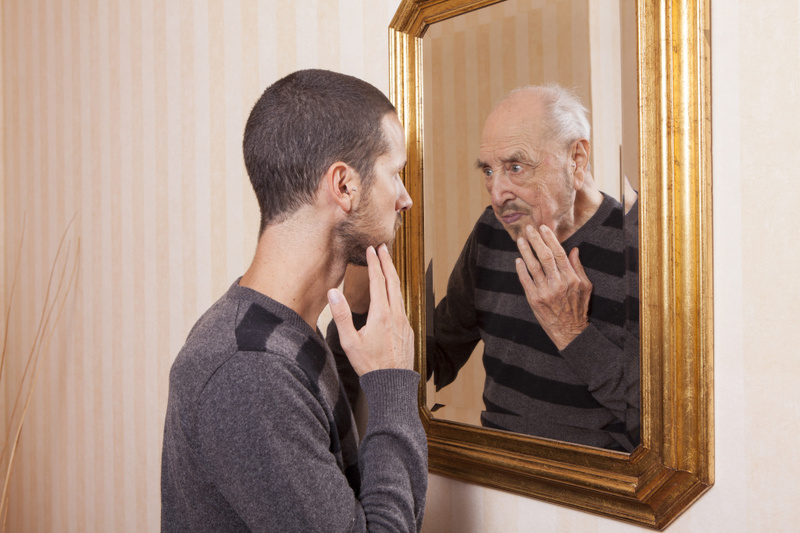 Each photograph features a person looking into a mirror and seeing a reflection of his/her significantly younger self. Result – a powerful and a poignant means to communicate the story of someone whose mind has gotten stripped of its more recent memories. Now let us try flipping the scenario. Let us try envisioning our future selves. Think about it for a moment. Is it as easy as envisioning our past selves? The answer tends to be in the negative. Well, mostly. Many studies establish our biological truth that one’s future self is a stranger within each of us. For example, Jason Mitchell – Professor of Psychology at Harvard – has found that when we picture ourselves experiencing something pleasurable a year from now, many of us use the brain areas involved in imagining a stranger. Biju Dominic’s latest piece is on this very insight and what it could mean for us as a society. He says that it is this lack of relationship between our present self and our future self that is at the core of many of our behavioural problems — from not saving enough for our retirement to unhealthy lifestyle practices and many more. This is such a compelling insight that I am tempted to go out on a limb and wager that this lack of a more intuitive relationship between our present and our future selves could actually be the key to solving for classic marketing challenges like low levels of penetration prevalent across several future focussed categories like BFSI (Mutual Funds, Insurance) or Beauty (Anti Ageing) or other FMCG categories (like Oats, Sugar free F&B variants) etc. The solution to this lies in getting our present self to be more aware of, relate to and empathise with our future self. It is known that the feeling of empathy between two persons diminishes as the physical and temporal distance between them increases. So how do we get our present selves to build empathy with a self that is 20 or 30 years ahead in future? Now that could be a great problem worth solving for, with creative possibilities in marketing communications. Biju Dominic’s article even provides thought starters for possible approaches. He writes..
Hal Hershfield, a social psychologist at UCLA Anderson found that people who spend a few minutes getting acquainted with a computer-generated simulation of what they might look like in the future were motivated to make better decisions about retirement planning. Now that’s a spring board of an idea – using computer generated simulation to show what one might look like in the future. Now hold on to that thought and juxtapose that with this famous Dove Sketches execution. Do you also see the possibilities that I see? This entry was posted in Advertising, Art, Branding, Concept, Consumer Behavior, Emerging Markets, Insight, Marketing, Narratives, Photography, Story Telling and tagged Ad Ideas, Adcept, Advertising, Alzheimers, Anti Ageing, BFSI, Biju Doninc, CPG, Dove, Dove Sketches, Exelon Patch, Future Self, Hal Hershfield, Ideas, IMC, Insight, Inspiration, Jason Mitchell, Marketing, Novartis, Oats, Past Self, Photography, Reflections, Story Boad, The Tim Ferriss Show, Timothy Ferriss, Tine, Tom Hussey. Bookmark the permalink.